This gun is super realistic! The Tippmann X7 Phenom M4 Carbine Replica Machine Gun is one of the best military tactical paintball rifles you can get. This lightweight, accurate and realistic .68 caliber paintball gun comes with a carbine stock and classic M4 hand guard and a very reasonable price. Buy the Tippmann X7 Phenom M4 Carbine tactical paintball assault rifle from our online store and we will make sure you get the best price and the best service possible. 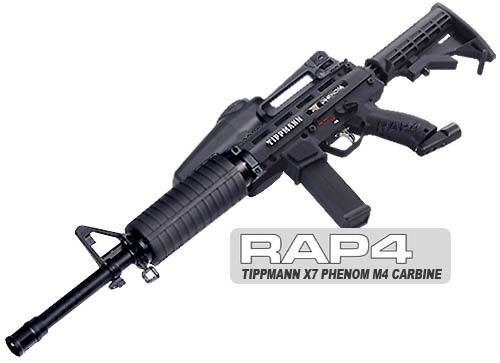 This gun has a solid 1 year warranty with Tippmann plus support from Rap4 if needed. We are also glad to answer questions about this marker (or any of our products). Our website has a 100% secure shopping cart for the safest and easiest shopping and we offer several fast, affordable shipping options. The Tippmann X7 Phenom is a great marker when it comes to power, range and accuracy, but its body is still just an SMG. This gun’s compact nature is great for front men and scouts or even as a back up weapon but you will want more if you want to play other areas on the field. The great thing about the X7 Phenom is it’s easily upgraded and makes a terrific rifle when you add a lengthened barrel. 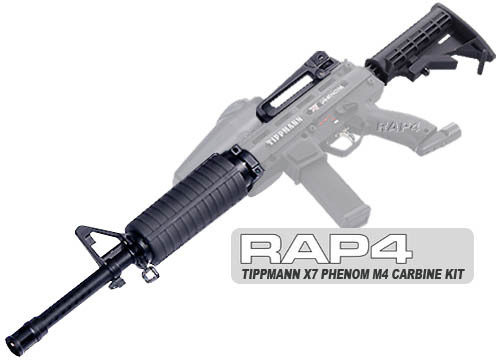 The Tippmann X7 Phenom M4 Carbine paintball gun is a great example. The Tippmann X7 Phenom as a replica M4 Carbine rifle is the perfect all around tactical marker if you’re looking for excitement from all areas on the field. As a replica, the X7 Phenom M4 is totally authentic with an adjustable carbine stock and classic M4 hand guard. The detachable carry handle also features windage and elevation adjustments to compliment the realistic M4 front sight mounted on the barrel. Besides its fierce appearance, you will fall in love with the performance of this paintball assault rifle after the first shot. Lightweight and super sturdy, the real features of this gun come stock with the X7 Phenom. A compact aluminum body and pushpin construction offer super easy field stripping and maintenance. The new Flexvalve technology operates below 300 PSI offering unreal air efficiency; you can easily get over 1,400 shots from a 68 cubic inch 4500 psi tank with this tactical rifle. The X7 Phenom also features a redesigned cyclone feed system, feeding up to 15 balls per second without batteries. This marker is excellent for use as a mid or back player; accuracy for long range shooting is not a problem! The Tippmann X7 Phenom M4 Carbine brings plenty of power; combined with a 16" barrel in the X7 Phenom tactical barrel kit; add a scope to the top of the carry handle and this paintball gun can easily be used as a carbine style sniper rifle if necessary! The Tippmann X7 Phenom M4 Carbine is perfect for playing the ranger or scout role on the scenario battlefield but this marker has nearly endless customization possibilities.